I'm writing to you because the Canadian prime minister, Justin Trudeau, wrote an admiring eulogy of Castro, mass murderer. 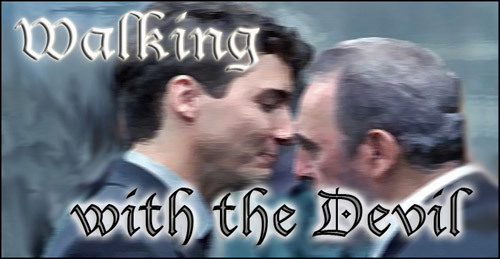 Today, my response: Justin Trudeau - Walking with the Devil. Canadians reacted in horror to Paul Bernardo, who murdered 3 young women - to Clifford Olson, who admitted to the murder of 11 children and young adults - to Robert Pickton, who murdered as many as 50 prostitutes. I think that feeling of horror is a healthy response. But Trudeau felt free to celebrate Fidel Castro, Communist dictator, who had over 100,000 murders of political prisoners to his credit. He dismissed criticism of his admiration with the comment that Castro was a controversial figure. The question, for me: HOW to respond in a way that people HEAR and FEEL Trudeau's lack of caring about 100,000 murdered people? My answer: Justin Trudeau - Walking with the Devil. Music. PLEASE LISTEN. And if you like the piece, PLEASE SHARE. As for, why music? Because music reaches us in a way that "idea words" don't. And because we don't have music on our side. In fact, we're blocked from having music on our side because the mainstream media wouldn't carry music that doesn't fit with its general anti-thinking and anti-freedom agenda. PS. Here are a couple of earlier pieces, in case you haven't had a chance to look at them.